Hortus Camdenensis | Tagetes patula L.
Half hardy, compact annual with feathery, pinnate leaves and solitary, often double flower heads in a colour range from yellow to red-brown, self-coloured or multi-coloured, depending on strain, born in succession from late spring to autumn. To 35cm, sometimes taller. There are many garden cultivars. [RHSE, Hortus]. 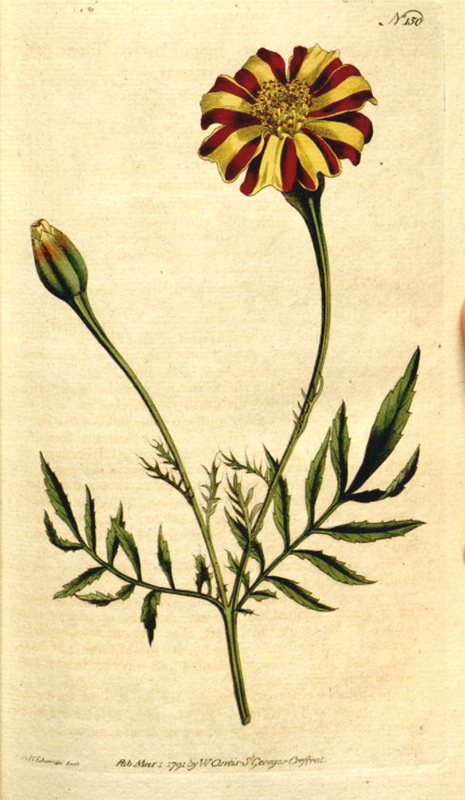 Tagetes patula was figured in Curtis's Botanical Magazine in 1791 and 1840. The earlier plant had single flowers with very distinctive yellow and red stripes, very similar to varieties such as ‘Jolly Jester’, still available today. The 1840 plant, figured as Tagetes corymbosa, had a large number of small single yellow flowers, again with its modern equivalent in such strains as ‘Single gold’. ‘For richness and variety of tints few flowers can vie with this species of Tagetes, which forms one of the chief ornaments of our gardens at the close of summer. Some authors make it a native of Africa, others of America. Two principal varieties are usually kept in the gardens, the common small fort with a strong disagreeable smell, and a larger one here figured, usually called sweet-scented, the former is of more humble growth, its branches more spreading, its blossoms smaller than those of the latter, the flowers of which have usually a greater portion of the yellow tint, and the smell of the other so modified as to be far less disagreeable; sweet scented we fear it can scarcely be called: from the seed of both sorts some flowers will be produced extremely double, and others single.’ [BM t.150/1791]. BM t.3830/1840. Introduced to Britain in 1573. [JD]. Although this plant is only listed in the 1850 catalogue Macarthur was almost certainly growing improved varieties by 1846. On 8th April 1846 he ordered seed of 12 varieties of Marigold of German origin from James Carter, Seedsman and Florist, High Holborn [MP A2933-1, p.128]. Seed of ‘Marigold, unique French dwarf, beautifully striped’ was also ordered from Warner & Warner, Seedsmen and Florists, Cornhill, on 12th April 1846 [MP A2933-1, p.131]. This was probably similar to the striped variety figured in Curtis’s Botanical Magazine and shown here. Although only listed in the 1850 catalogue it seems unlikely that such a versatile and easily grown plant would have been lost.